Unless you're extremely diligent about PC maintenance, you'll find your computer eventually starts to slow down, and may even begin freezing or crashing. 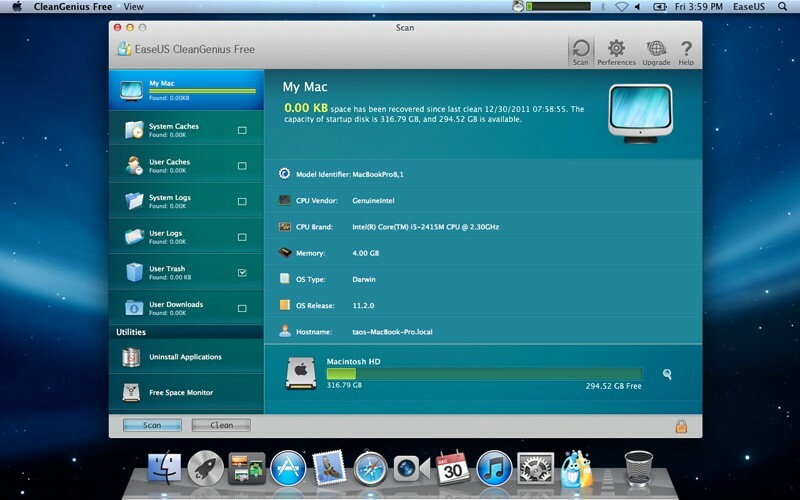 CleanGenius contains a selection of tools that can find and fix Windows problems, free up disk space, repair Registry issues, speed up your computer and safeguard your privacy. The interface looks a little confusing at first, with lots of options and buttons to click. You should first run either a quick or deep scan. Both options let you choose which areas vou want to tarqet. With a quick scan, the program can delete junk files, remove invalid shortcuts, optimise your system configuration and clear traces of your PC and internet activity. The deep scan adds network optimisation and disk defragmentation to the list. Most of the modules offer a choice of options. The system optimiser. for example, lets you specify your PC's main use: home computer with or without networking, work computer or gamebox, so CleanGenius can use the most suitable settings. You can run a straight scan; a scan and clean; or a scan, clean and shutdown. With a straight scan, you can review all the findings and choose what to remove before clicking the Clean button. You can also export the results in an HTML file to look at later. Other options available from the main screen include Privacy Protect, which removes usage traces from your browser. Windows history and other areas; Turbo Boost, which speeds up your system by shutting down unnecessary background processes; and Utilities Box, which offers several handv tools including a memory manager and driver back-up.